"In the simplest terms, CrossFit is an incredibly effective strength and conditioning program." In the simplest terms, CrossFit is an incredibly effective strength and conditioning program. The CrossFit Method will prepare you for life and sport better than any other training regime in existence today. If there were another system that worked better we would steal it and use it at CrossFit Asperitas. CrossFit is the principal strength and conditioning program for many police academies and tactical operations teams, military special operations units, champion martial artists, and hundreds of other elite and professional athletes worldwide. It is also being implemented in nursing homes, pre-schools and physical therapy…..if you fit somewhere inbetween it can probably help you. The CrossFit program is designed for universal scalability making it the perfect application for any committed individual regardless of experience.We’ve used our same routines for elderly individuals with heart disease and cage fighters one month out from televised bouts. We scale load and intensity; we don’t change programs. CrossFit was developed in Santa Cruz California by Greg Glassman in the Late 90′s. Coach Glassman’s mission was to develop a CODE for FITNESS via Clinical trial, i.e. measuring inputs and outputs. He achieved this by developing a training regimen that was CONSTANTLY VARIED, focused on FUNCTIONAL MOVENTS, and was performed with HIGH INTENSITY. The CrossFit Community has taken what works best and eliminates what doesn’t, if an exercise provides superior results it stays in the program, if not it is banished to the scrap heap. CrossFit is the most effective fitness program created to date remains – bar none. Through years of ongoing clinical trial (20,000+ people a day do CrossFit now) this quest has developed into a fitness movement that is spreading rapidly around the world. From the “average Joe/Jane” to the military, police, professional and amateur athletes CrossFit is delivering results like no other fitness program before it. This “Code” addresses the fitness of the elderly as well as that of an elite athlete, the only difference being load and intensity need to be scaled for the individual. What we have found is that the best results from both groups and everyone in between are produced when training with Functional Movements (that which replicates real life movement), at High Intensity and with Constant Variety. Any exercise program that meets these three criteria can be considered “CrossFit,” from shoveling dirt, hauling rocks and cutting down trees to weightlifting, pull ups and sprinting. There are ten recognized general physical skills, and we train each of these here at CF Asperitas. They are cardiovascular/respiratory endurance, stamina, strength, flexibility, power, coordination, agility, speed, balance, and accuracy. CrossFit recognizes that you are only as fit as your weekest link, and has developed a fitness program that improves each of these ten skills. Cardiovascular/respiratory endurance- The ability of body systems to gather, process, and deliver oxygen. Strength – The ability to apply force. Power – The ability to apply maximum force in minimum time. CrossFit has been called “The Sport of Fitness” because it re-introduces personal athletic achievement and performance to training. The mindset at the start of each workout is to be stronger, move faster, more efficiently, with better form than ever. This is why even after years of training CrossFit style, scores and times in workouts continue to drop and athletes continue to improve. It’s hard, fun, exciting, challenging, and will push you to be your absolute best! 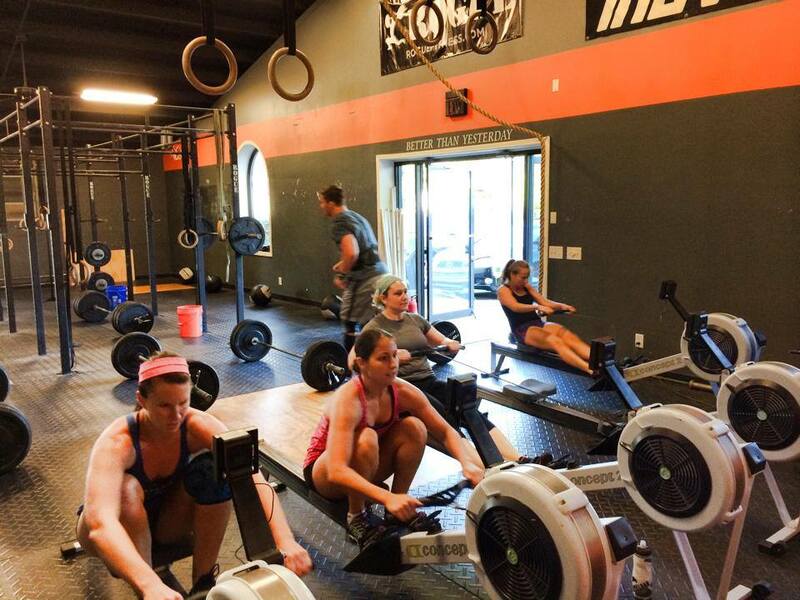 CrossFit is by design broad, general and inclusive. Its specialty is in not specializing, and its workouts elicit a maximal neuro-endocrine (neuro = Brain & Central nervous system, Endocrine = Testosterone, Human Growth Hormone, Insulin like growth factor) response from your body by taxing your body to its core with variety, intensity, and multiple joint, full body, functional movements. If you walk away from your workout with “gass left in the tank” then you probably re-evaluate your workout regimen. In gyms and health clubs throughout the world the typical workout consists of isolation movements and extended aerobic sessions. The fitness community from trainers to the magazines has the exercising public believing that lateral raises, curls, leg extensions, sit-ups and the like combined with 20-40 minute stints on the stationary bike or treadmill are going to lead to some kind of great fitness. Well, at CrossFit Asperitas we work exclusively with compound movements and shorter high intensity cardiovascular sessions. We’ve replaced the lateral raise with push-press, the curl with pull-ups, and the leg extension with squats. For every long distance effort our athletes will do five or six at short distance. Why? Because compound or functional movements and high intensity or anaerobic cardio is radically more effective at eliciting nearly any desired fitness result. Startlingly, this is not a matter of opinion but solid irrefutable scientific fact and yet the marginally effective old ways persist and are nearly universal. Our approach is consistent with what is practiced in elite training programs associated with major university athletic teams and professional sports. The CrossFit program endeavors to bring state-of-the-art coaching techniques to the general public and athlete who haven’t access to current technologies, research, and coaching methods.